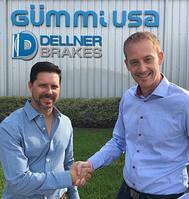 Swedish-based Dellner Brakes has acquired US brake and clutch company Gummi USA to consolidate its position as one of the world’s leading suppliers of brakes and related power transmission products for the industrial, marine and offshore markets. “Dellner’s technologically advanced disc brakes, systems, power packs and components are distributed all over the world for use in marine and industrial applications. Gummi’s product range will complement this perfectly, allowing us to add high quality drum brakes, clutches, and couplings to our offering,” adds Aberg. “As part of the Dellner group, we will have access to a wider global market for our products and we will also be able to capitalise on Dellner’s renowned technical expertise and focus on innovation, which will enable us to further enhance and develop our product range. That’s great news for us, and for our customers,” concludes Roca.